Thousands of cases of police brutality are reported in South Africa each year but only a fraction of them ever result in criminal charges. This was revealed in the Independent Police Investigative Directorate’s (Ipid) half-yearly report on cases lodged against police in 2016, released in July. Ipid tracks deaths in police custody, deaths as a result of police action, police shootings, rapes committed by police, complaints of torture or assault against police officers, and accusations of corruption within the police force. 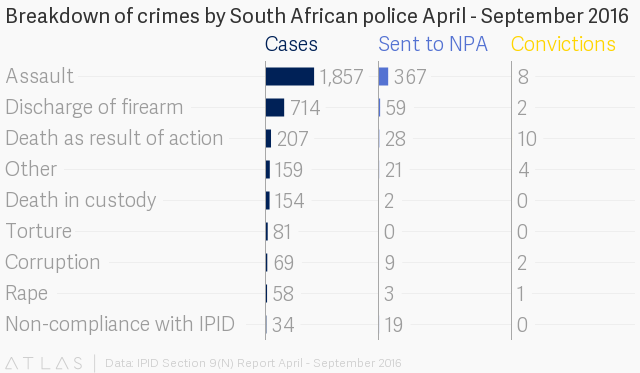 Between April and September 2016, 3 313 cases were reported to Ipid; 98% of these cases involved the South African Police Services (SAPS) and 2% involved metro police. Over the same period, only 508 cases were referred to the National Prosecuting Authority (NPA) and only 27 criminal convictions of police officers were made. Assault was the most common type of case brought against police. During this six-month period, 1 857 reports of assault were filed. Of those, 387 were referred to the NPA, which led to just eight convictions. When a member of the public lays a complaint against an SAPS or metro police officer, Ipid first investigates the matter. It then decides whether the officer should be disciplined internally or whether it should make recommendations to the NPA to pursue criminal charges. If criminal charges are laid, Ipid then provides the court with evidence. 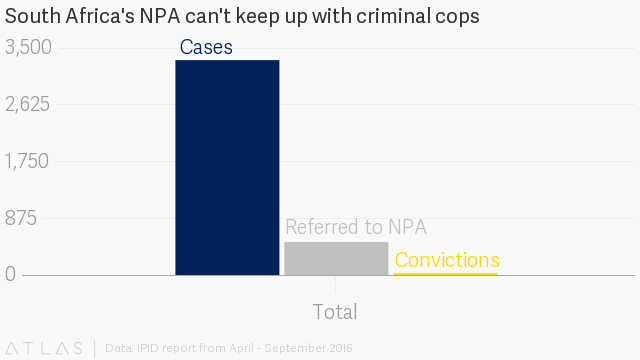 But Ipid refers far fewer cases to the NPA than it receives each year; fewer still are ever convicted. For example, in the 2015/2016 period 3 506 cases were lodged but only 721 cases were referred to the NPA and only 38 cases were convicted. Why are conviction rates so low? There are several reasons for the low conviction rate. One of the key challenges, according to Ipid, is access to resources. In the foreword of the report, Ipid director Robert McBride said that because of budget cuts, Ipid was forced rely on SAPS to help with investigations which “may impact on the integrity of the investigations and Ipid’s independence”. Essentially what this means is, because of a lack of funding, Ipid now relies more heavily on police to investigate their colleagues. Another factor was the limited number of Ipid district offices and the vast distances that Ipid officers sometimes have to travel to reach alleged crime scenes. “It is near impossible to preserve the integrity of crime scenes due to the long distances travelled by Ipid investigators to reach those crime scenes,” he said. Johan Burger, a senior researcher at the Institute for Security Studies, said Ipid has been extremely underfunded since it was formed as the Independent Complaints Directorate in 1997. He said investigating charges of assault against police could be difficult because, in addition to genuine cases of assault, there were also cases where people laid assault charges against police simply for touching them. This added to the high levels of assault claims laid against police and low levels of criminal charges. Another challenge was that police were investigating highly trained colleagues who were “streetwise”, officers who understand the law and know how to obstruct investigations. Ipid spokesperson Moses Dlamini said there were also a range of issues “beyond the control of Ipid,” which could affect legal proceedings. Some of these were relying on witnesses or victims who recount their ordeals in their submissions. Witness intimidation was a problem, he said, but he could not comment on the extent of it. Dlamini pointed out that prosecutions did not always happen during the same year in which charges are laid, and may carry through to the next year. “All Ipid can do is conduct quality investigations which then assist prosecutors to make a decision to prosecute or not, but the actual prosecutions happen in the court,” he said.